If you’ve been following us on Facebook, you might have seen me mention that there’s a new way to get from Los Angeles to San Francisco. Megabus, the discount bus carrier that has served the U.S. East Coast and Canada for several years now, has started service on new double decker buses between some of California and Nevada’s most populous cities: San Francisco, Oakland, San Jose, Sacramento, Riverside, Los Angeles, and Las Vegas. Update: Boltbus recently started running buses on this same route. 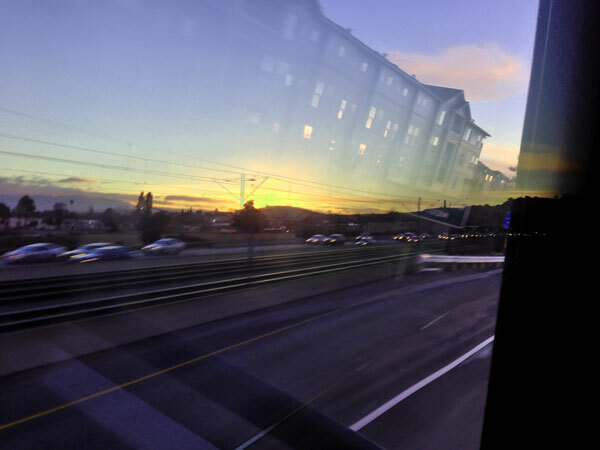 For a review of Boltbus, check out this post. I never really considered taking a bus to Los Angeles. I’d looked at Greyhound fares before, but the buses usually take 8 or more hours, stopping several points in between the start and end point. With discount airfares being (rarely) as low as $59 each way but always under $99 each way, it’s never seemed worth it to take such a long trip. Some day I hope to ride the planned California High-Speed Rail bullet trains that will travel from Los Angeles to San Francisco in only 2.5 hours, but as with any large infrastructure project in the US, it’s moving ahead slowly while fighting off a lot of well-organized and well-funded opposition. Until then, travel via road and air are our only options. 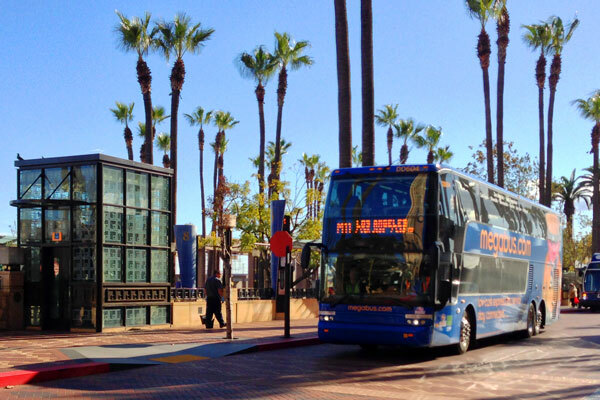 To celebrate the introduction of their new service, Megabus offered a promotional special of only $1 each way from Northern to Southern California! Tickets from San Jose to Los Angeles were nearly nonstop–6 and 1/2 hour, with one 30 minute rest/food break midway. Total cost round trip (with $0.50 booking fee) = $2.50! I couldn’t pass up a deal like that! 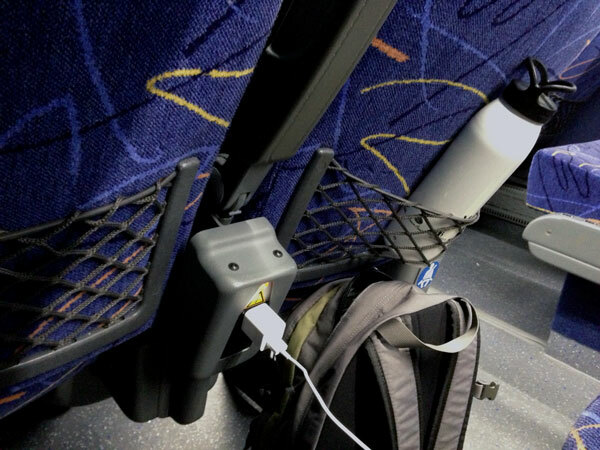 Not to mention, the buses have bathrooms, electrical outlets AND free wi-fi. That was huge for me–I find the distance much easier to tolerate if I can use the internet to do work on my plugged-in phone or laptop. I’m not sure whether Megabus fares will stay this low, but for now it’s a great budget alternative to flying. The wi-fi is slow and sometimes intermittent. This didn’t bother me that much because I was able to use my iPhone (having the electrical outlet was more important for me). But if absolutely you need to have internet access to get work done on the route, bring a laptop data card or a tablet with a data plan. Try to get the top-deck front seat. If you do, you’ll get an unobstructed, wide expansive view from the large front and side windows. Great for taking photos! Bring a snack. 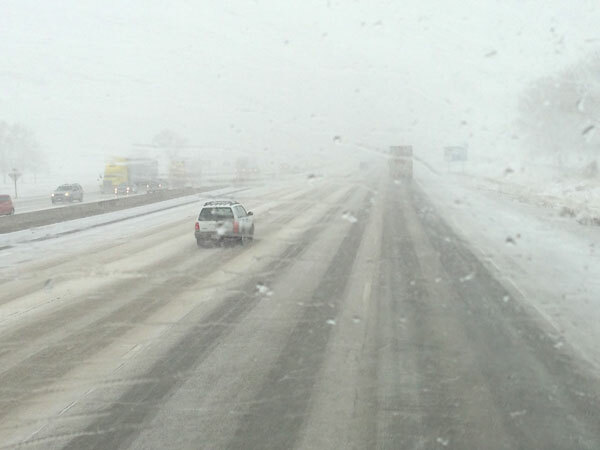 It’s a long ride and you may want to be prepared for potential delays. The bus does make one rest stop mid-way through the trip, but the only options at the rest area are fast-food chains and gas-station junk food. Dress in layers and bring a scarf or blanket to cover up with if traveling in the winter. I was pretty cold for the first 2 hours of the southbound trip after departing in early morning at sunrise. 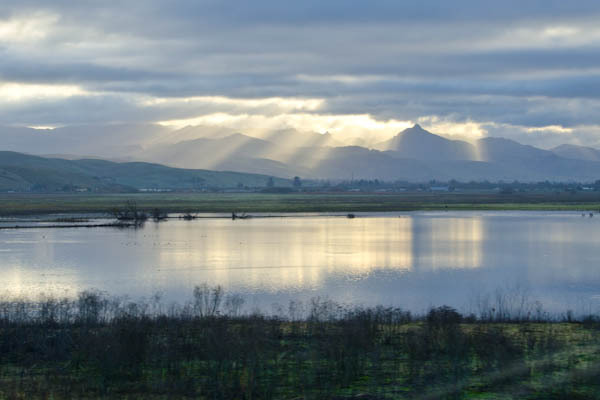 I didn’t warm up until we reached the central valley and the high sun started shining in to the big windows around me. I suspect that the top deck is difficult to heat and cool. And this is the way it looked only 17 minutes later when passing Pyramid Lake at 12:12pm. 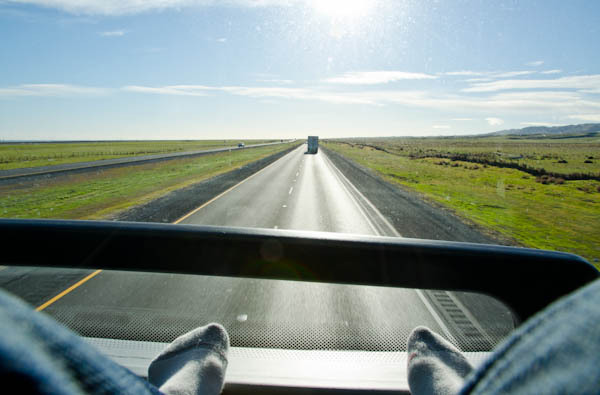 But in between the pretty vistas, there’s a whole lot of this in the center of California–wide, empty expanses that are boring to drive through, so it is really nice to just sit back and enjoy the view, sleep, or lose yourself in a book or electronic device. The buses into Los Angeles arrive at the centrally-located Union Station in downtown Los Angeles where you can very easily transfer to the city’s MTA metro bus/rail system, Metrolink and Amtrak regional rail systems, or rent a car (Budget and Hertz have offices in the station). So in conclusion, I had a great experience with Megabus, and this new offering certainly changes the equation when deciding how I’ll travel from Los Angeles to San Francisco in the future. Even if next time it costs a bit more than $2.50! 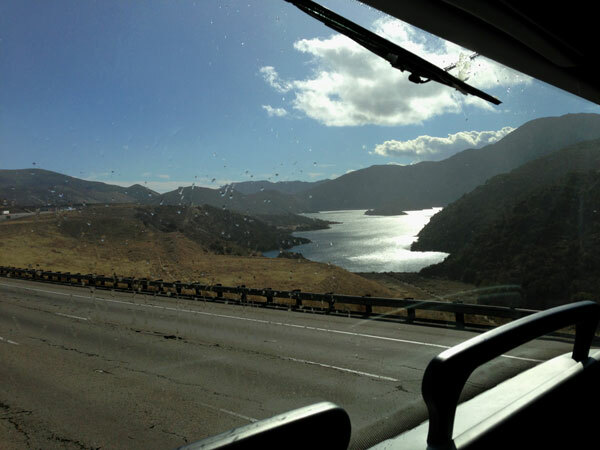 Click here to learn more about Megabus and book your trip. For information about another bus service running this route, check out this review of Boltbus. Have you ever taken Megabus? What did you think? My sister lives in SF and my parents live in LA and I know the second my mother gets wind of this, she is going to make my sister take it! Glad to hear it was a decent experience. I tried to take a Megabus when we were in NYC, but the driver never showed up. I could only take ’em if I knew they were reliable. The ride was only $1 at the time also, so it wasn’t a huge loss, but we waited at the station forever. Yuck, that’s really annoying! I was fearing something like that would happen (flashbacks to a terrible experience on Ryan Air in Europe) but it worked out okay this time. Cool… that’s really cheap… how do they even make money? What I got was just an intro special and I assume they’re trying to make it up in volume, but even the regular prices are low! I’m going to San Francisco on the 15th of this month and I’ll be leaving at the LA station. I’m really nervous because I don’t arrive in SF until 8:10 pm, and I’m hoping my aunt picks me up. My issue is whether or not the SF stop is just a curb stop or it’s in front of the CalTrain station, something for me to safely wait in while my aunt drives over. Hi Michelle, You can find a map of where the Megabus stations are at this link: http://us.megabus.com/busStops.aspx. It looks like the San Francisco stop is right next to the San Francisco Caltrain station which is open until after midnight so you can go in there to wait. Hope that helps! Hi, Cassie. Thanks for the replies. They helped to ease my worries. I’m curious, though. Is there any place for my aunt to park near the Caltrain station? In fact, she might not be able to pick me up because of the sorta late arrival time, and she has work in the morning. Do you know if there are any taxis that I can take just in case? There is street parking on Townsend street, she may be able to find a spot there. And there should be lots of cabs around there, but if you want you could bring a SF taxi company’s phone number just in case. Have a great trip! Whoops. Another thing I’m wary of is the luggage. I want to bring a small suitcase (the ones with wheels) and I’m aware of the luggage rules. So, is that small suitcase fine? Is there someone there that’s going to weigh it to see if it respects the under 50 lb limit? Hi Michelle, a small suitcase is fine and the bus driver won’t be weighing your suitcase so don’t worry about that. Personally, I always prefer to pack as little as possible when I travel. Packing a lot is exhausting, slows you down, and leaves you open to losing things. If you want some tips for how to reduce the amount of stuff you pack (I generally use a carry-on size backpack), I posted some here: http://www.everintransit.com/carry-on-travel-womens-packing-list/. Have a great trip! I live in SF but also part of the year in L.A. I’m thinking of giving Megabus a try. You sure can’t beat the prices, especially if you plan in advance. 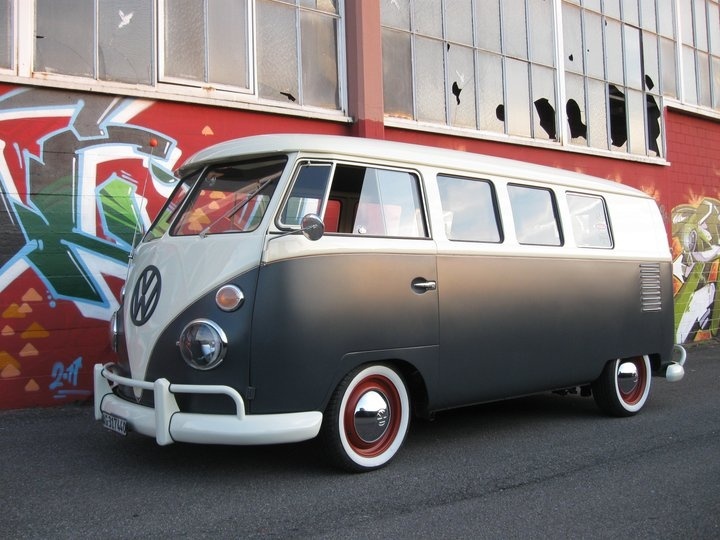 Nice blog guys…Good layout and photos…. Thanks, Nicholas! Let us know when you are in the Bay Area, I’d love to meet up! I am a frequent megabus rider. I enjoy it because of wifi connections, able to sleep and rest and sit comfortably in an air conditioned bus. I listen to my favorite music and really relax my mind. Thanks for sharing, Ellen! I agree that the quiet time is really nice and having wifi access makes the time fly! But I think Mega Bus would be cheaper and more comfortable during my first California-Trip? My idea is, at first it would be a short visit – maybe about 4 weeks as a kind of “warm-up”.